(January, 2011) Lawrence Berkeley National Laboratory (LBNL) has released a 34-page report to the public: "Community Wind: Once Again Pushing the Envelope of Project Finance," by Dr. Mark Bolinger. The report describes innovative financing and organizational structures for five community wind projects constructed in 2010. Community Wind and Small Wind Energy conferences provide necessary tools for locally-owned projects. Windustry continues the Community Wind across America conferences series with an event for the Mid Atlantic Region, February 8-9, 2011. It follows 2010 events in the Rocky Mountain and Midwest regions. The conferences cover Community Wind and Small Wind in a two-track program, providing the full range of what's needed to advance opportunities for locally-owned wind energy production. The Mid Atlantic program includes a keynote address from Jacques Beaudry-Losique, Wind and Water Program Manager at the U.S. Department of Energy, former CIA Director James Woolsey, a renewable energy and energy security advocate. 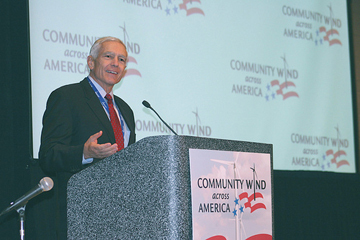 Wesley Clark tells conference goers Community Wind is in the "sweet spot"